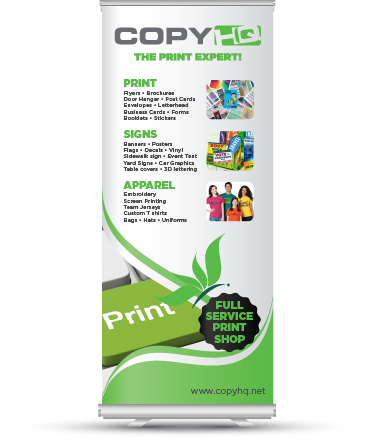 Copy HQ – The Print Expert! At Copy HQ, we are committed to getting the job done right. You can count on us to be there every step of the way as you grow your business. When we say "one stop shop," we mean it. Whatever printed material you may need, we can deliver it and exceed your expectations. Need signs for your next event? We got you covered. When it comes to producing your marketing materials, we can create anything in any size on any material for any purpose. We can do everything from wall murals to business cards, screen printed t-shirts to trade show signs, banners to color copies. You name it; we will do it.